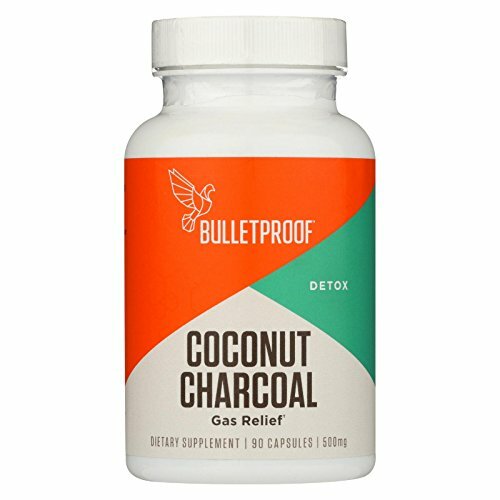 Bulletproof – Upgraded Coconut Charcoal Capsules – 90 ct.
Bulletproof – Upgraded Coconut Charcoal Capsules – 90 ct.. Activated charcoal is a highly absorbent material with millions of tiny pores that can capture, bind, and remove up to 100 times the charcoal’s weight in toxins. The porous surface has a negative electric charge that attracts positively charged toxins and gas to be carried easily out of the body. Toxins from low quality, processed food, and environmental pollution are a real problem. It is important to help your body eliminate them to promote a healthy digestive system and brain. Chronic exposure to toxins produces cellular damage, allergic reactions, compromised immunity, and more rapid aging. Regular use of activated charcoal is easy on the colon and can remove unwanted toxins from your body, leaving you feeling renewed and more vibrant, often in minutes. Try it even once and you’ll feel a difference! Upgraded Coconut Charcoal is 100% made from coconut shells. The ultra fine and highly purified Upgraded Coconut Charcoal uses acid washing, a more expensive extra step that removes toxic heavy metals that are prevalent in many preparations of charcoal. This added step results in charcoal with the most surface area to create maximum adsorption. Activated coconut charcoal is mainly used to remove toxins from the body, so it’s great to use after consuming food of unknown quality, eating out at restaurants, or drinking alcohol. Toxicology studies show activated charcoal to be harmless, not interfering with sleep, appetite, or well-being. (+) Everyone responds differently to different doses, so to avoid potential undesirable effects such as constipation, please consult your doctor and use only as suggested: Take two or more capsules when consuming food of unknown quality or alcohol. Warning: The high adsorption of charcoal may reduce effectiveness of certain medications. Consult your healthcare provider before taking charcoal. Never take charcoal at the same time as medications. May cause harmless darkening of stools. At high doses, may cause constipation.